Bring some serious color to your life, and brighten up your living space. 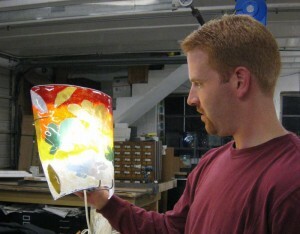 This is the perfect way to use glass in a most practical application: a lamp. You will design your own colored glass, determine your own shape, and have your choice of several different hanging or mounting options. For considerably less than the price of a designer fixture, you can put your own name on one. Tuition includes glass, mold materials, and mounting hardware. No glass experience is needed, and electrical experience will be provided. This entry was posted in light sculpture by admin. Bookmark the permalink.